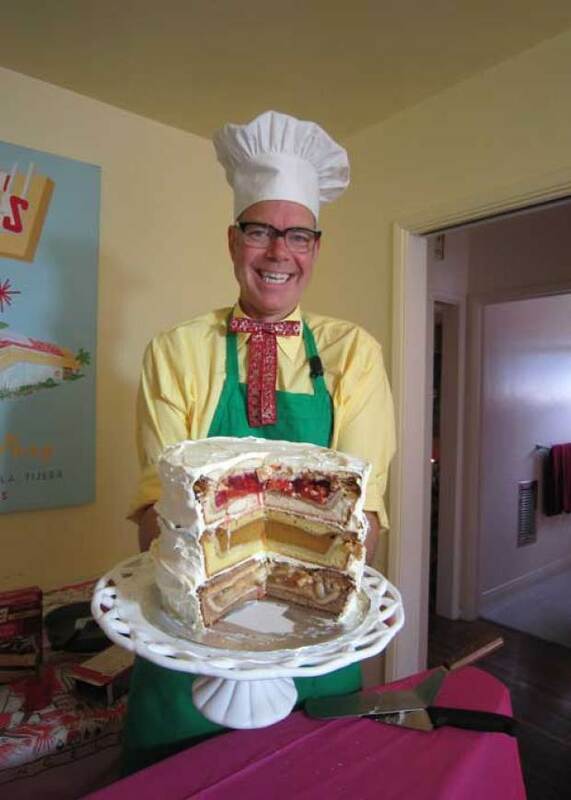 Here it is, the recipe for Charles Phoenix's Cherpumple. Three pies inside three cakes, an explosion of flavor for the holidays. Not sure you're up to making one? Mr. Phoenix will show you how in the video at the bottom of this article. 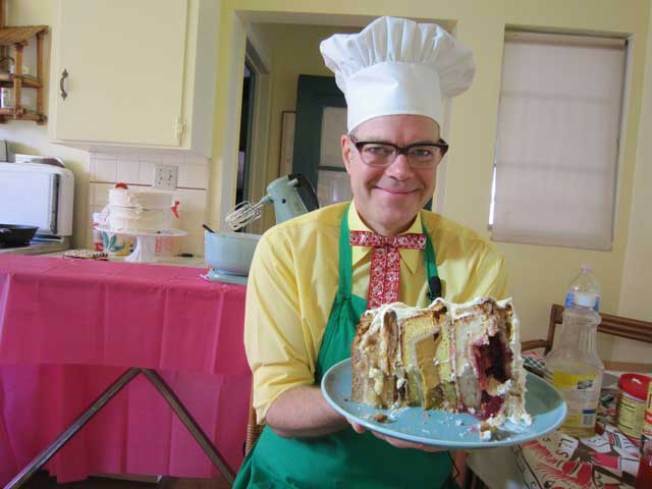 The Cherpumple is a baking project which involves a lot of pie, cake and engineering. Bake pies according to instructions and cool to room temperature overnight. Mix cake batter according to instructions. For each layer pour about 1 1/3 cup of batter in the cake pan. Carefully de-tin the baked pie and place it face up on top of the batter in the cake pan. Push down lightly to release any trapped air. Pour enough batter on top to cover the pie. Bake according to box instructions. Cool and remove from pans the frost it like you mean it. Since it's the most wonderful time of the year …perhaps the cream cheese frosting should be dyed mint green! And, yes, you can serve your Cherpumple FLAMING! Then you can call it CHERPUMPLE PIE CAKE FLAMBE! Why, oh why didn’t think of that sooner? 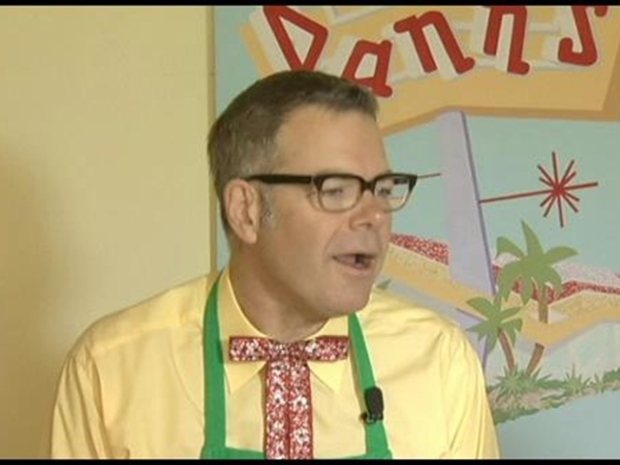 Well actually I did but I was afraid that I would burn the vintage stove shop down where we filmed the video. I’ve heard those old stoves have a lot of trapped gas! To serve your “monster” pie cake FLAMING …its easy… just make a little puddle of lemon extract in the frosting on the top of your cake. Just before you light it gather friends and family around, turn out the lights and watch it burn. Make sure to have 911 on speed dial just in case. Just how would you explain to your nosy neighbors that the desert version of the turducken burned your house down and singed theirs? Be fully prepared for gasps and ahhhhs as your guests see pie inside cake for the first time. Cherpumple ala mode anyone? Pie cake and ice cream go SO well together.